Dovetail Games wants to reel you in with an all-new Fishing Sim World teaser. The latest in gaming's niche selection of sim titles, Fishing Sim World makes lofty promises that it's "the most authentic fishing simulator ever made". 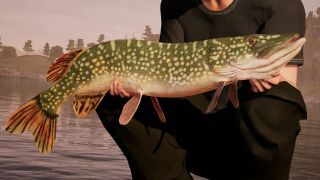 "Feel the adrenaline rush of landing trophy largemouth bass and the thrill of fighting huge carp and monster pike as Fishing Sim World perfectly combines realistic game physics and accurate fish AI for an authentic fishing experience that will have you hooked from the start," states the game's description. "Your angling skills will be tested to the limit as you explore two vast USA bass lakes set in Florida and upstate New York and five European locations, including France’s famous Gigantica Main Lake and even a challenging stretch of the UK’s Grand Union Canal." Though brief, the teaser video gives a flavour of what the game has to offer, including stunning environments, dynamic weather, that quiet contemplation time, plus the feverish chase of trophy fish, of course. The sim includes 18 different species of fish with "hundreds" of items to collect, including a boat with GPS and sonar to secure that special catch of the day. Especially keen anglers can pre-order the game now and net themselves (heh) Early Beta Access, a Fishing Sim World boat, five pre-order rods and reels, and a special in-game pre-order t-shirt. Fishing Sim World is out on PC and PlayStation 4 on September 18, 2018. If you can take on any more fishy fun, check out our guide to the very best fishing games.